With the start of a new year, I always find myself wanting to clean up my eating and detox a little bit. I’m sure I’m not alone in that! Smoothies are my go-to breakfast pretty much all year long, but over the holidays I tend to eat far more pancakes and waffles than usual, just because I can. Come January, I like to get back to basics a little bit, so today I wanted to share one of my favourite smoothie recipes with you! 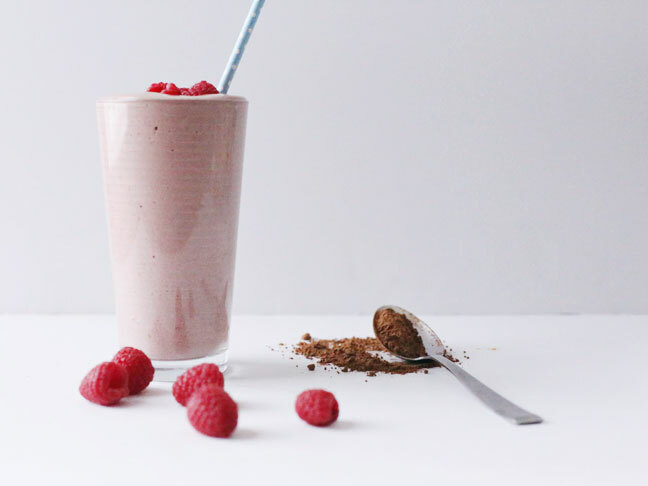 This Detox Chocolate Berry Smoothie recipe features yummy, wholesome ingredients and no added sugar so it’s a nice option if you’re looking to lighten things up a little bit. 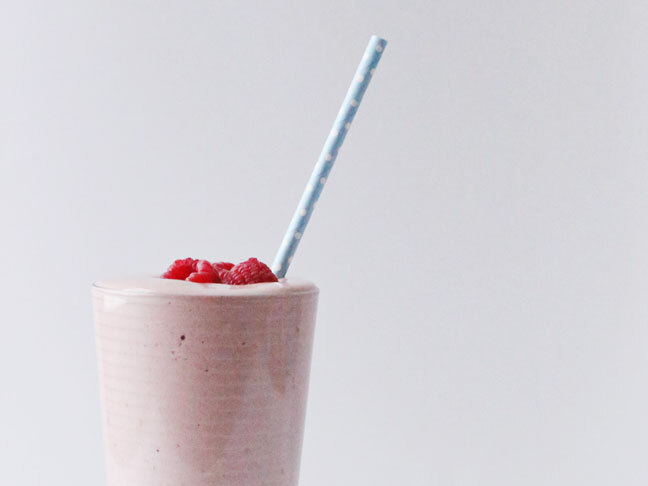 Come January I like to get back to basics a little bit, so I'm sharing my favourite smoothie recipes! Step 1: Begin by placing all of your ingredients in a blender. Blend on high speed for 2 minutes. Step 2: If your smoothie isn't as thick as you'd like, add more ice and blend again. If your smoothie is too thick for your liking, add a bit more almond milk. Step 3: Pour into a glass, top with a bit of fresh fruit if you like and voila! You're done. Time to start sipping. 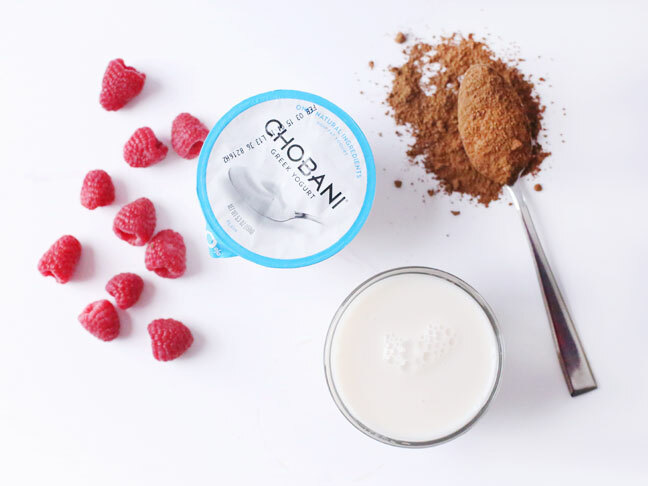 If you prefer a different kind of berry, feel free to sub out the raspberries. Strawberries are particularly yummy! 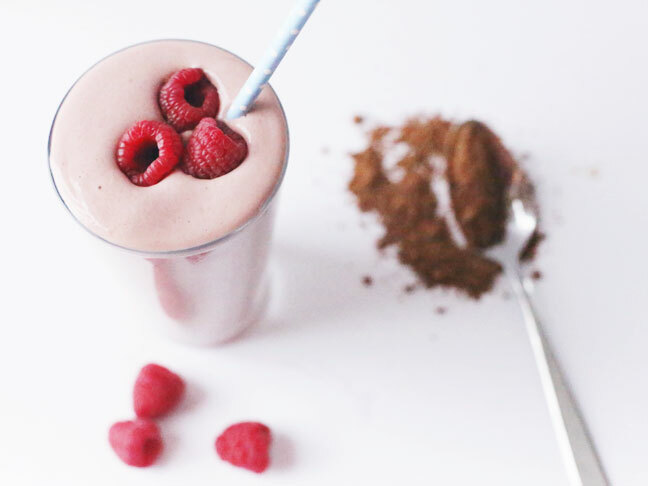 If you want to use carob powder instead of cocoa powder, that works great in this smoothie, too. I use almond milk, because other than a bit of Greek yoghurt and the occasional cheese, I limit the amount of dairy I consume. That said, use whatever milk makes you happy. If you'd like your smoothie a bit sweeter, I'd suggest using a bit of honey or stevia to keep it as healthful as possible. A lifelong lover of design and a party animal at heart, Cyd celebrates her passion for entertaining, crafts, photography, food and home decor at The Sweetest Occasion. 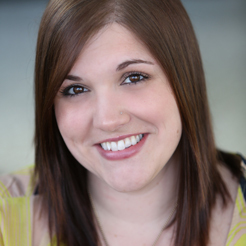 Regularly featured by magazines such as Better Homes & Gardens, Every Day with Rachael Ray and BRIDES, Cyd resides in the 1000 Islands region of Upstate New York where she can often be found with glitter in her hair and wanderlust in her soul. In her free time it's good dark coffee, the laughter of her two favourite little boys and taking trips to the farmer's market with her better half that fill her days with glee.